Award winning wildlife artists and quality taxidermy is created in South Africa at the Nico van Rooyen Taxidermy studio. These Professional wildlife artists are highly trained and skilled in the process of creating quality wildlife taxidermy art pieces that are true to life in terms of behavioral detail. This attention to detail and realism is what makes these award winning wildife artist so well known in South Africa. 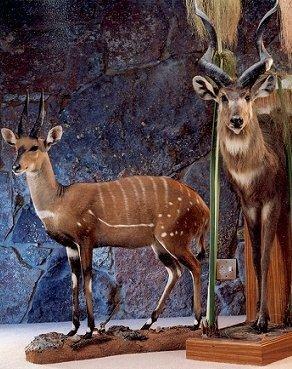 Taxidermy mounts are placed within a taxidermy wall mount or habitat created by habitat experts. The habitat professionals work in conjunction with wildlife artists in order to create award winning wildlife taxidermy. Award winning wildlife graces the homes of keepers of quality wildlife as well as museums who only display museum quality mounts which turn out to be award winning mounts. These quality mounts truly reflect the skills of perfection wildlife artists who create wildlife wall mounts with the main objective of creating award winning wildlife taxidermy.